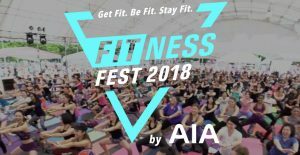 FitnessFest by AIA 2018 | JustRunLah! Kick-start your fitness journey or rev it up! Let’s move to fitter, healthier, happy lives together. Join in live workouts with a stellar line-up. Sweat it out, discover new workouts, learn about healthier living, fuel up with clean eats, and connect with like-minded people. Sweat it out! Get a boost of endorphins at the FitnessConcert™ held at our main stage arena – a fit-athon of live mass workouts with Fitness Celebrities and top professionals. Healthy eats and treats to keep you fueled throughout the day. Plus more bites and take-home wellness products at the Wellness Market. Meet like-minded people and grow your #SweatBuddy tribe. Many have met at FitnessFest and continued their friendship working out together. Experience live workouts with fitness celebrities and top professionals; learn from the best instructors and get inspired by fitness inspirations. The 2018 line up includes Kayla Itsines, Sandra Riley Tang, Bryan Tay and many more.